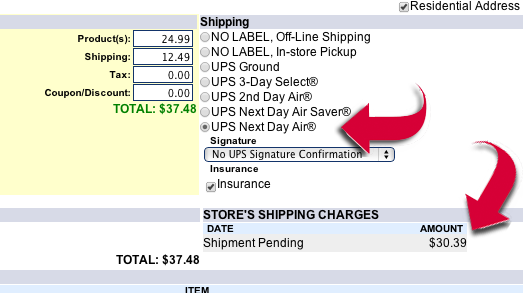 If a customer selects 2-Day Air, then changes her mind and needs the item over-nighted, how would I handle that? It would depend on the status of the order. If you have already processed the order and its status is "shipped," then you would have to throw the shipping label away and go to UPS.com to create a new shipment. Next you will need to charge the customer's card for the difference in shipping using either your in-store swipe machine or your Authorize.net virtual terminal. If the order has not been processed yet, then you would just change the shipping method to Next Day Air, which will display the new cost of the shipping in the shipping area. 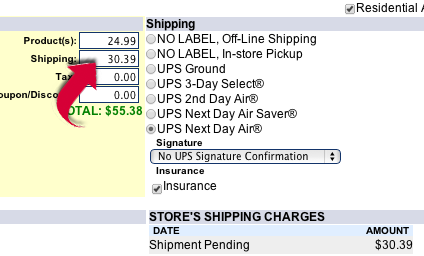 NOTE: You have to then go to the shipping field to the left and manually change the amount. You will get a warning that the amount is now more than the original order. Hit OK and then Proceed. When you select Execute, the new amount will be charged to the card.